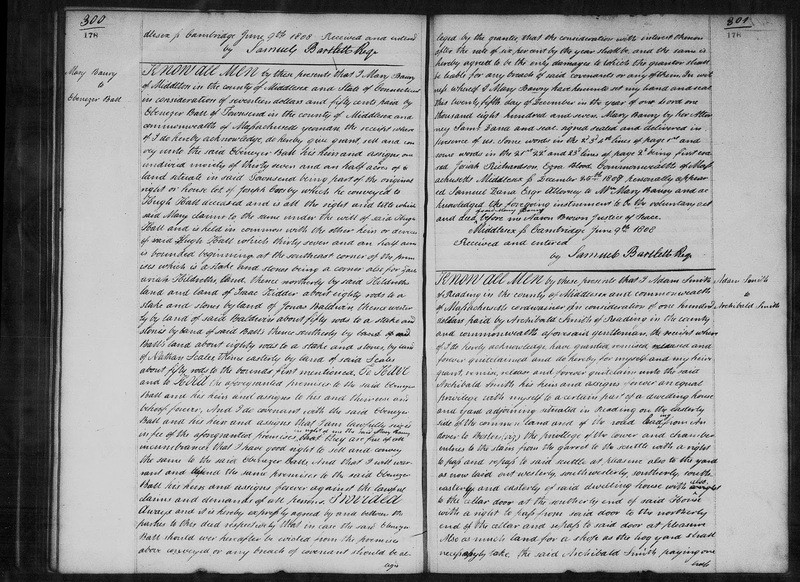 Genea-Musings: Amanuensis Monday - 1807 Deed of Mary Barry to Zachariah Hildreth in Townsend, Mass. 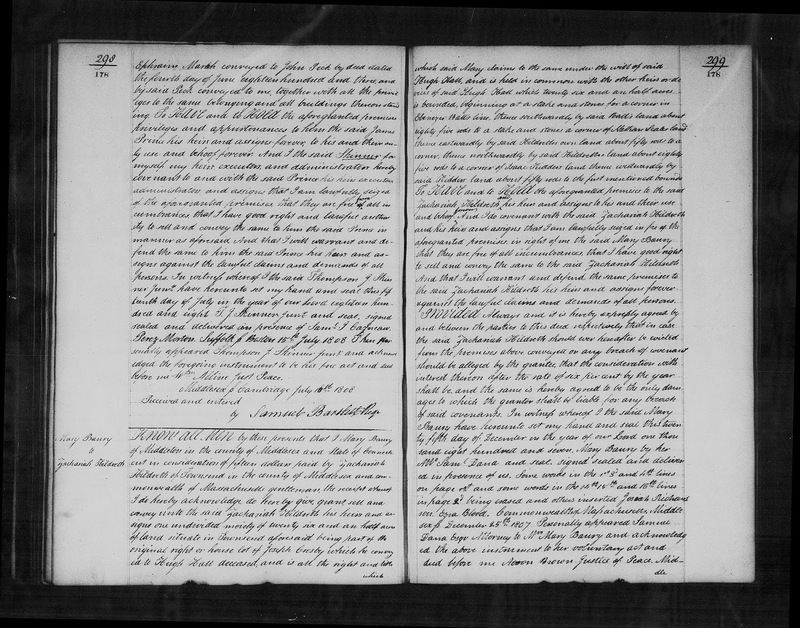 Amanuensis Monday - 1807 Deed of Mary Barry to Zachariah Hildreth in Townsend, Mass. said Kidders land about fifty rods to the first mentioned bounds. 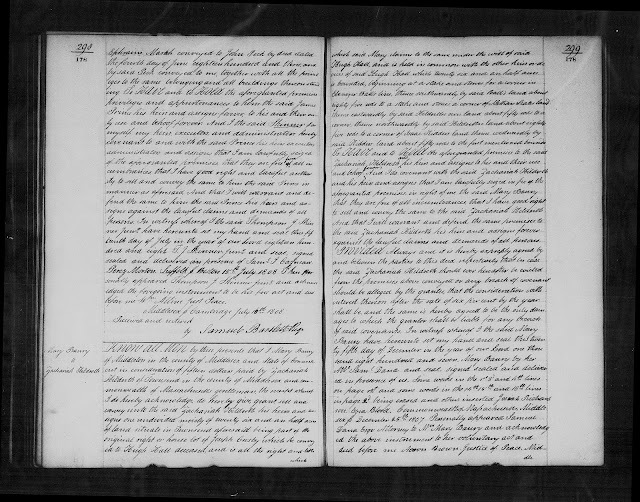 "Massachusetts, Land Records, 1620-1986," digital images, Church of Jesus Christ of Latter-Day Saints, FamilySearch (https://familysearch.org : accessed 23 December 2018), Middlesex County, "Deeds, 1808, Vol. 178," Volume 178, pages 298-300 (images 162-163 of 276), Deed of Mary Barry to Zachariah Hildreth, executed 25 December 1807, recorded 9 June 1808. This deed is for 26 and a half acres of land in Townsend, adjacent to land owned by Ebenezer Ball, Nathan Scales, Zachariah Hildreth and Isaac Kidder. Zachariah paid 15 dollars in 1807 for this piece of land, which measures 85 rods (1,402.5 feet) in one dimension (easterly and westerly), and 50 rods (825 feet) northerly and southerly, in a rectangular shape. The index entry for this deed calls the grantor Mary "Barry" but the written surname looks more like "Banry" or "Baury." She apparently resides in Middleton, Connecticut and her attorney, Samuel dana, handled this transaction.